I’ve been looking at a lot of Albrecht Dürer images lately. I acquired a secondhand book about Dürer recently, and I already had a book of the etchings and engravings. One day I must get the companion book of the woodcuts. I’ve also been able to see some of the woodcuts ‘in the flesh’ a couple of days ago, since the Queensland Art Gallery has the entire Apocalypse series, plus a few other woodcuts, on display at the moment. (on show until 21st July 2013). Dürer is of course, one of the greats of Western art history. Born in 1471 in Nurenburg, he was part of the great revolution in image making and distribution brought about by the development of the Gutenburg Press around 1450. 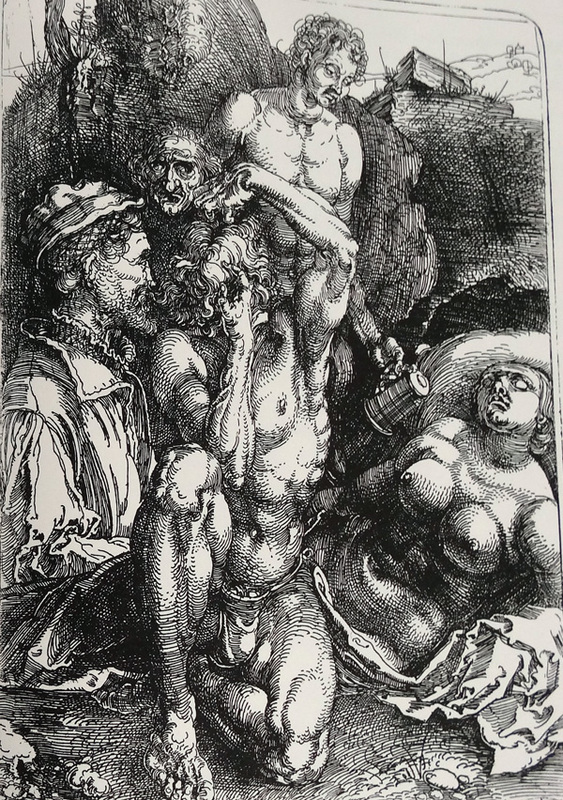 One of my favourite Dürer images is the one above, sometimes titled ‘The Desperate Man’, though Dürer himself gave it no title. 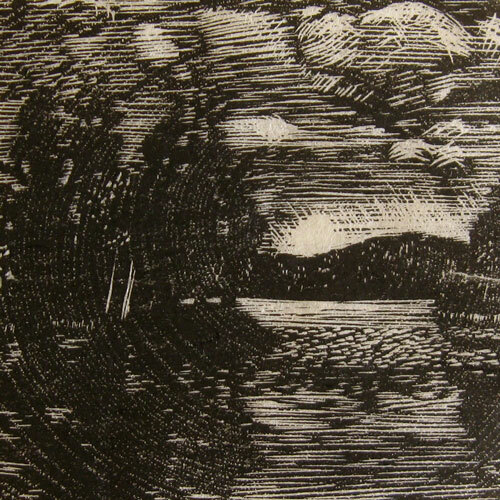 It is not a woodcut, but an etching done in iron plate, and possibly his first use of this medium which was in it’s infancy at the time. So, with all this as background, and having just bought some ply wood with the intention of making some new woodcuts, and armed with the love of reversals and contradictions perhaps common to printmakers, I set about making a new work based on The Desperate Man. So, in making a woodcut homage to one of Europe’s first great woodcut artists, I’ve chosen to base it on one of his etchings – a medium he seems to have made infrequent use of (there are many intaglio prints by Dürer – mostly engravings). When I teach relief printing, I seem to end up talking a lot about ‘black line’ and ‘white line’, and indeed I thought about this again in making this print (and I wrote about black line way back here). You see, when Dürer made woodcuts, along with those that followed for many many years, his designs were ‘black line’. An image would be drawn on the wood in black ink, and then the negative spaces lowered by carving, so that the lines would be left in raised relief (and hence the term relief printing) where they would receive black ink to then be transferred to paper. Lately I’ve been preferring to make images with a ‘white line’ approach, thinking of the marks made by the carving tools as positive white lines on a black ground, coalescing to create and image delineated in white lines. This doesn’t alter the nature of the way the process works – it is still the raised areas that receive and transfer the black ink, it’s just a different way of thinking about the creation of the image. 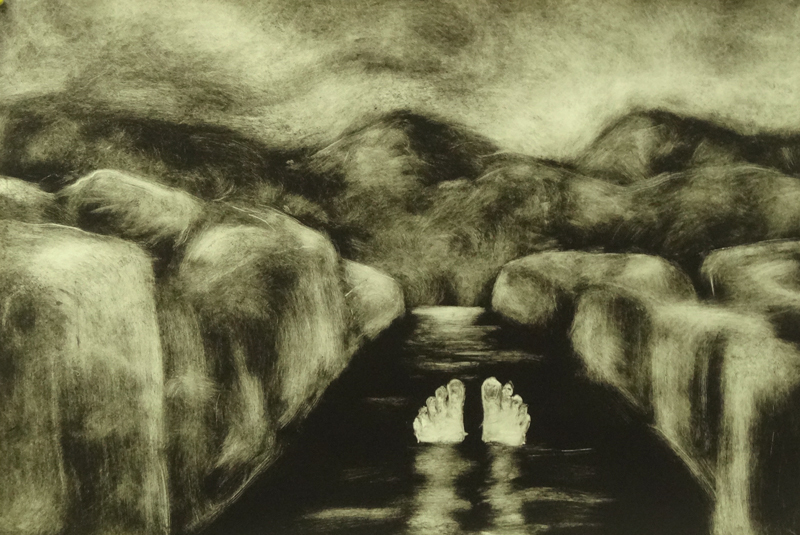 A lot of my recent images have been made in this way, from drawing with white chalk or pastel on black paper, to the monotypes of white clouds and skulls hovering in black spaces. Indeed with this new print of The Desperate Man, I have continued my recent liking for bleed printing, that is printing right to the edges of the paper rather than leaving a white border. I think this enhances the idea of the white line, making up the white object floating in a black field. Viewers are sometimes fooled into thinking these prints are printed in light ink on dark paper, so used are we to the idea that the ‘negative space’ of an image equates to being ‘left blank’. I love to watch that moment of confusion as people viewing these works figure out the mechanics. 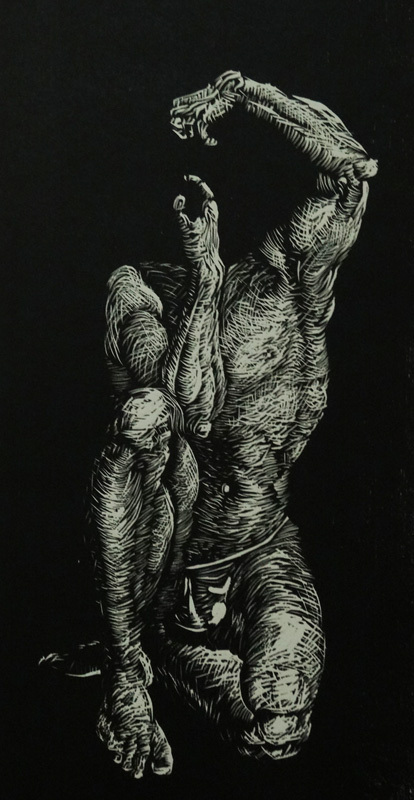 To come back to that idea of printmaking being an inherently contradictory beast, this is indeed the case with a relief print, in the sense that the areas that print are those where no carving has taken place, but this is often masked in the way the conceptualy active parts of a design often seem to be made up of the blacks. In a black and white image of course, as with any binary system, one side cannot work without the other. Confusing? Perhaps now you feel like The Desperate Man. (Yes, I know, I’ve left out his head. All the better to display the wonderful pose of the hands, which somehow makes me think of Child with a Toy Hand Granade by that rather more modern master image maker of humanity, Diane Arbus. The Queensland Art Gallery, incidentally, also has some Arbus photographic prints on display at the moment). I began teaching a new class today at the National Art School in Sydney. 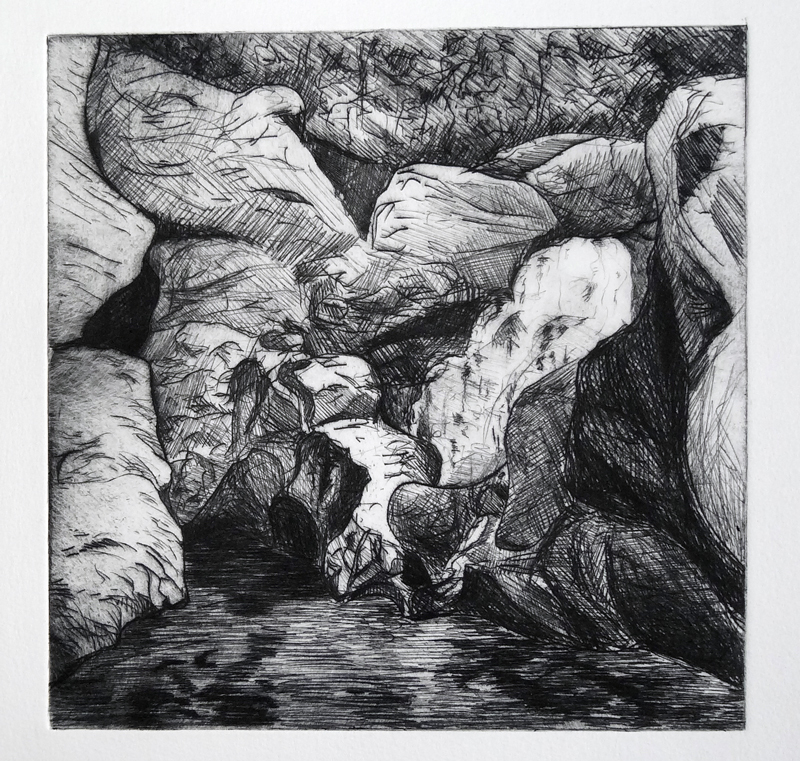 I have been working with first year students over the last six weeks, giving an introduction to woodcut and etching. Today I began working with second year printmaking students on a relief printing course and began by introducing them to wood engraving, which is one of my favourite techniques to work with and also one I particularly enjoy teaching. I think that is partly about it being a technique that is not practiced my many people, and offered as a class quite infrequently, so I enjoy the idea of being one of the people who is keep that knowledge and practice active. It certainly didn’t look like the NAS tools had been used recently. I think the students were a little surprised to see how small the blocks were that they were being provided with, but I soon managed to impress on them the fineness of mark-making that is possible and they have all undertaken admirably ambitious designs that they soon realised will take time enough to carve, despite (or perhaps because of) being so small. I look forward to seeing some of the images start to be printed some time tomorrow. I am also offering a number of other opportunities to learn this medium in the coming months, with weekend workshops running in Newcastle and Brisbane. On the weekend after (25/26 May) I will have made my way north, and will be running the workshop at the Brisbane Institute of Art in Windsor, with more information and enrolments available on their website. The BIA phone number is (07) 3857 5377. 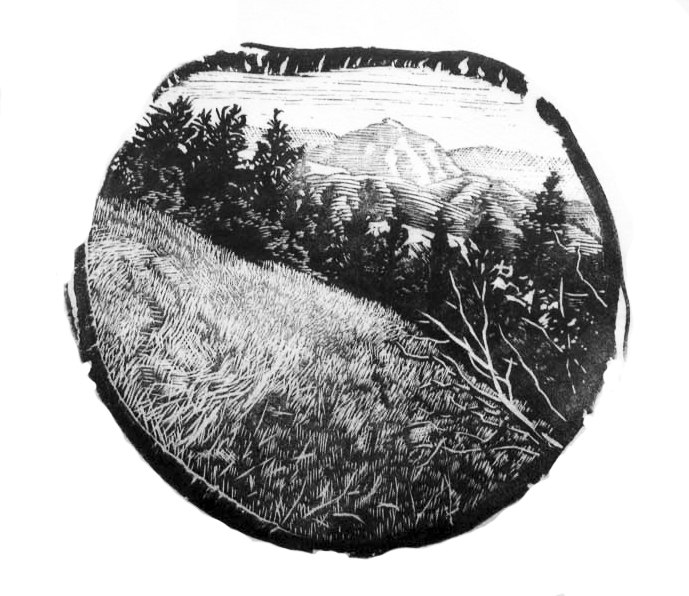 I will also be teaching wood engraving and woodcut as part of the NAS public programs winter school in July, with more information available on the NAS website soon. Last night saw the opening of Diversity in Print an exhibition of prints at the Royal Queensland Artist Society gallery on Petrie Terrace (Brisbane). 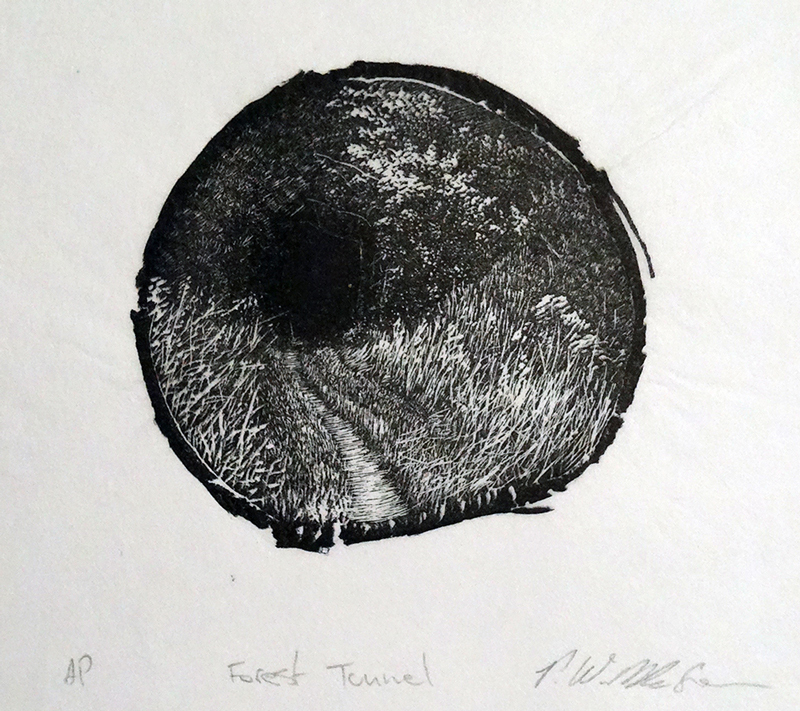 I’m in Sydney teaching at the moment so couldn’t get to the opening of course, but the good people there phoned to tell me I had been awarded a second prize for the wood engraving Forest Tunnel shown above. 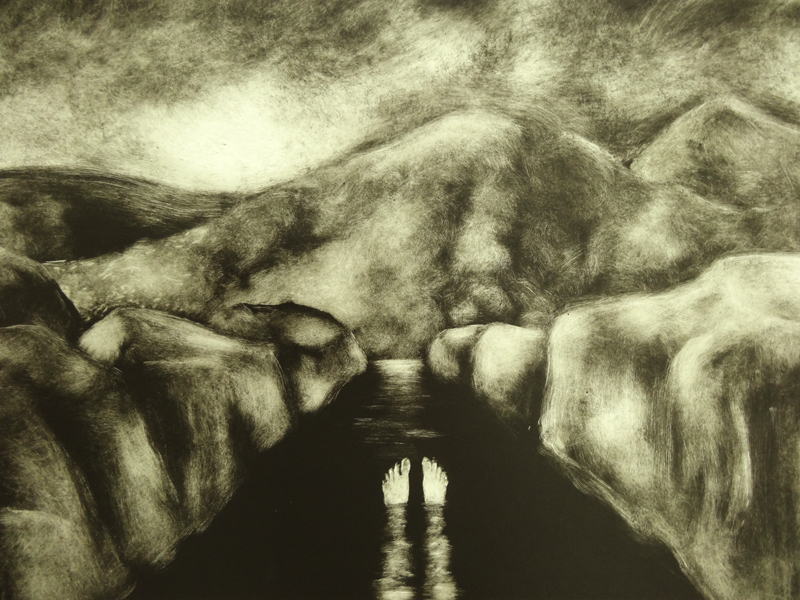 This print was one of the ones I made in California, while at the JB Bunk residency. I particularly like the crispness of the printed bark, that I had carefully retained on the block of birch wood as I cut and polished it prior to carving the image. This print also makes use of hand printing with a banana leaf barren in such a way as to produce subtleties of tone through the controlled use of variable pressure. 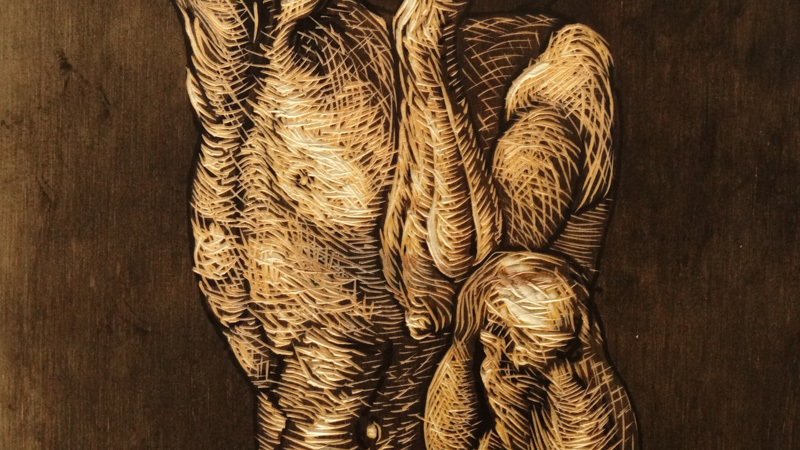 I’m glad to have been able to represent the somewhat neglected art of wood engraving in a show called Diversity in Print. The show is on until 23rd March at 162 Petrie Terrace, Brisbane. 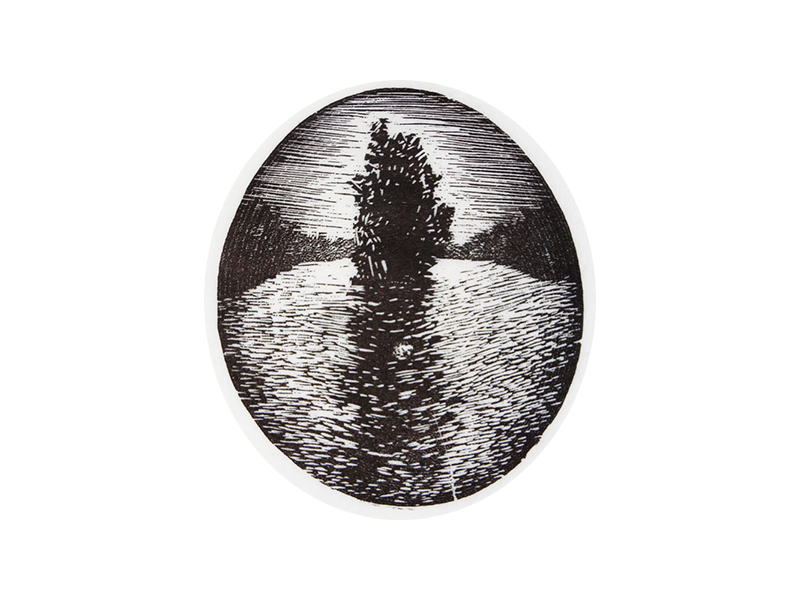 I am once again offering two day printmaking classes in the exquisite art of the wood engraving. A traditional relief printing technique best known for the ability to capture very fine detail in small scale images that draw the viewers attention into a miniature world. This round of classes will be offered in Brisbane on February 9/10, and Inverell (NSW) February 23/24. For more details and enrolments for the Brisbane workshop, see the Brisbane Institute of Art website at: http://brisart.org/ and follow the links to classes. 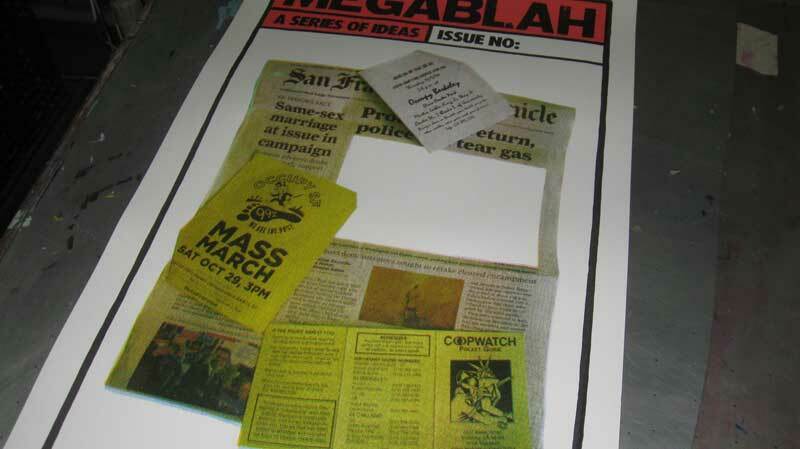 Megablah is a members project being run by Megalo Print Studio in Canberra. Inspired by Noel Counihan’s The Broadsheet publications, produced in the 1960’s featuring relief prints by Counihan and others. 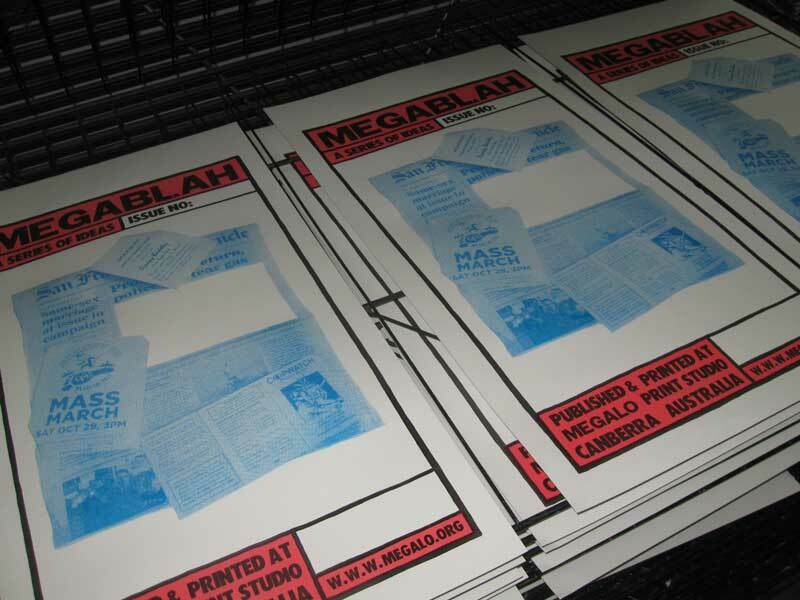 Everyone using the studio’s at Megalo is being encouraged to make a megablah – or even just submit and image and they will make it for you! 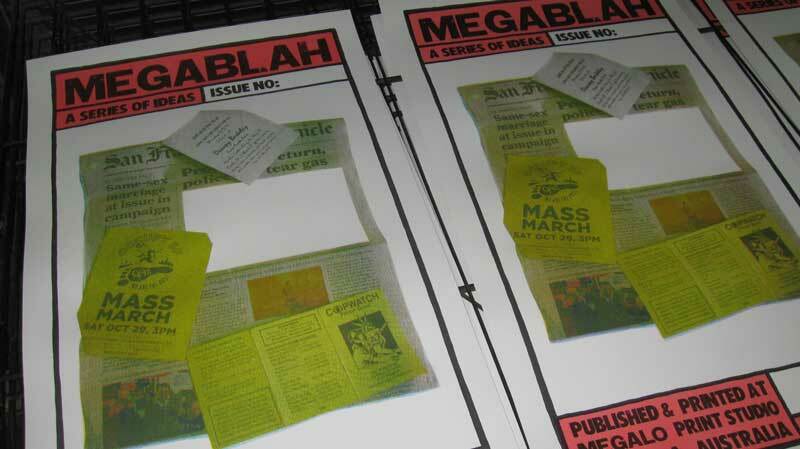 So of course, over the last few weeks, a megablah has been one of the things I’ve been working on. 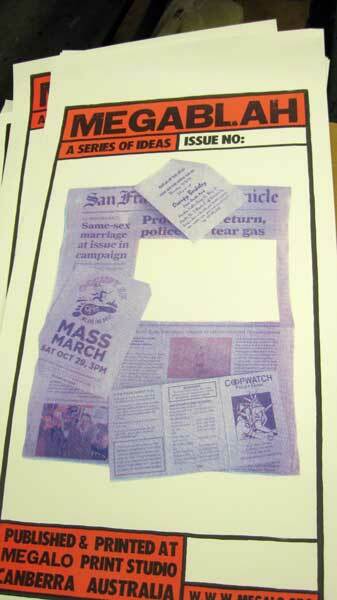 With Counihan’s work being the loose inspiration, I wanted to make something with a more obvious political content. 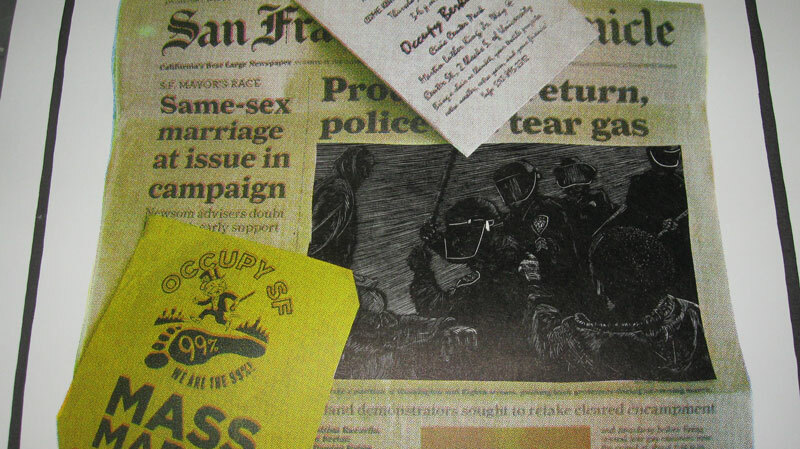 So it was, that I decided to make use of the copy of the San Francisco Chronicle I had kept from last year, along with some of the leaflets I picked up at various Occupy Encampments. I left California in late October 2011, when the Occupy Camps were still in full swing on the streets, and it was very much an issue in the media. First colour down, Cyan. Megalo had already printed up the border for me, I just had to insert my image. Second colour down, so with Cyan + Magenta it’s looking pretty purple. 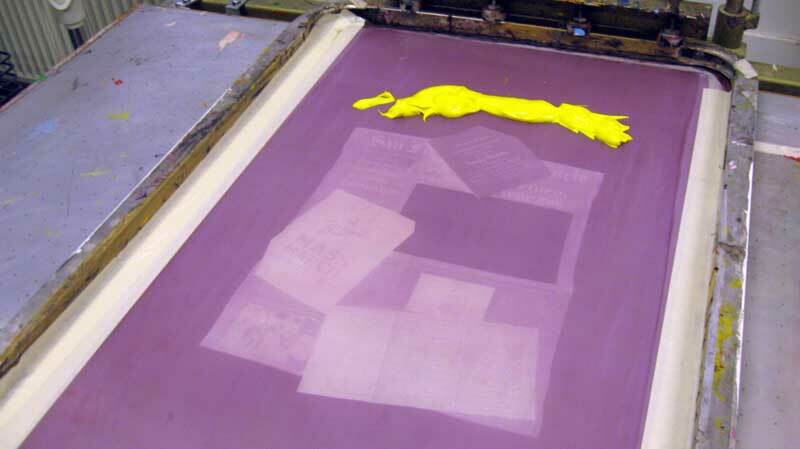 The yellow screen, clamped in the table and ready to print. So now with Cyan, Magenta and Yellow all printed, it’s looking pretty good (though it did end up a bit over yellow in some spots). The final black will really make it zing, even though in this case there was a lot less on the black screen than I would have thought. And There we are. I just love the way the shadows under that top part of the image really make that bit of paper seem to sitting above the rest. The final stage to complete the image was to cut out and paste in the wood engraving I had made previously to replace the main photo of some pretty heavy looking police action to clear the Oaklands Occupy Camp. Quite pleased with the final result. On one level it’s simply a recreation of my memorabilia, documenting a particular episode in history. On another level, the two types of print used refer to newspaper imaging old and new, with wood engraving being the original means of producing illustrated newspapers, and of course CMYK and halftone is the current technology.